There are different label types depending on the different business and requirement with data elements. 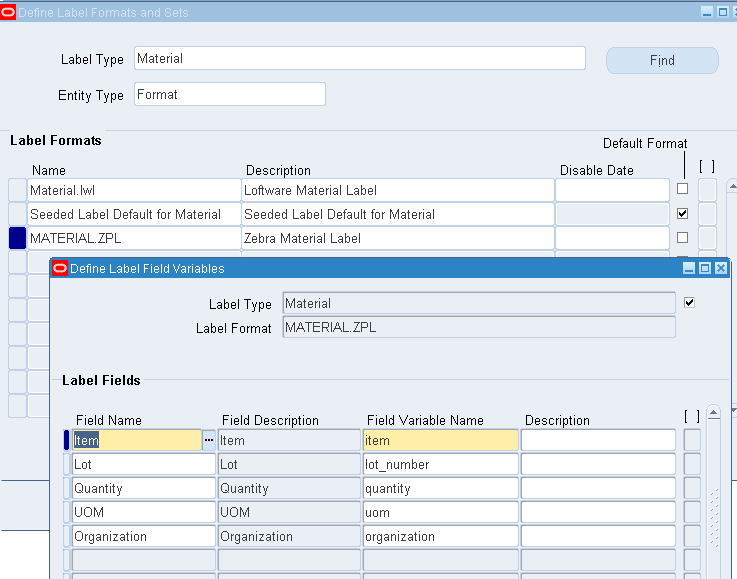 A single design of a label that may include fixed data (such as field prompts) and variable data (such as Part Number). A Label Format is associated to a Label Type. It includes a subset of the available data elements from a particular Label Type. A label type can have multiple label formats, however each Label Format belongs to only one label type. Label Formats are registered within Oracle Warehouse Management after you create the label design in the third party software package. An integration mode between Oracle Warehouse Management and the third party software supplier that is handled through dropping an XML file into a watched directory. When using this mode, Oracle Warehouse Management has no knowledge of the status of the print request after creation of the XML file. A real-time integration mode between Oracle Warehouse Management and the third party software vendor that is handled through a PL/SQL API. When using this mode, the third party supplier is able to return success or failure messages regarding the status of the label print request. Oracle Warehouse Management stores those messages in the label print history so label printing problems can be easily identified and diagnosed. A real-time integration mode between Oracle Warehouse Management and the 3rd Party software vendor that is handled through a standard Ethernet TCP/IP connection. 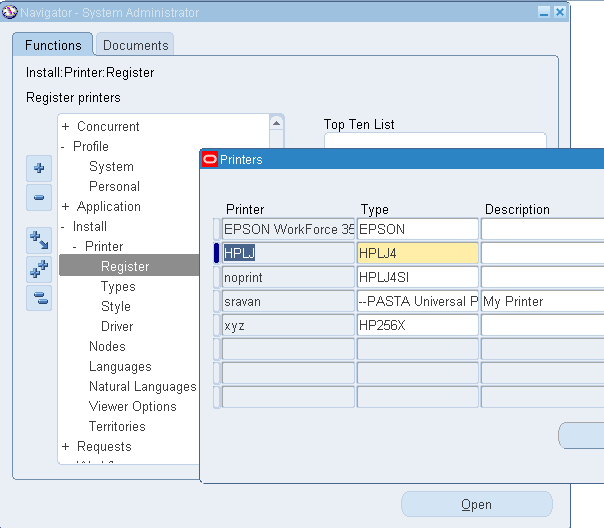 When using this mode, Oracle ensures that the printer or print server is listening to the IP and port and has successfully received the message, but no knowledge of the detailed status of the print request beyond acceptance of the XML message is known by Oracle Warehouse Management. 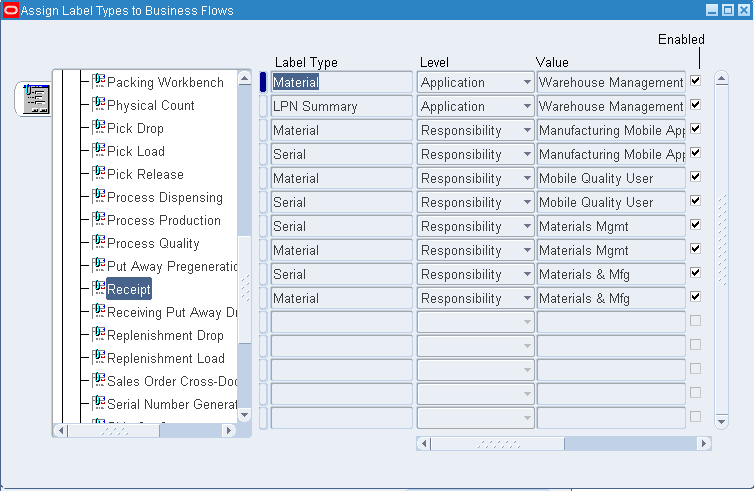 Business Flow: An identifiable business process that occurs as part of material handling within Oracle Warehouse Management. 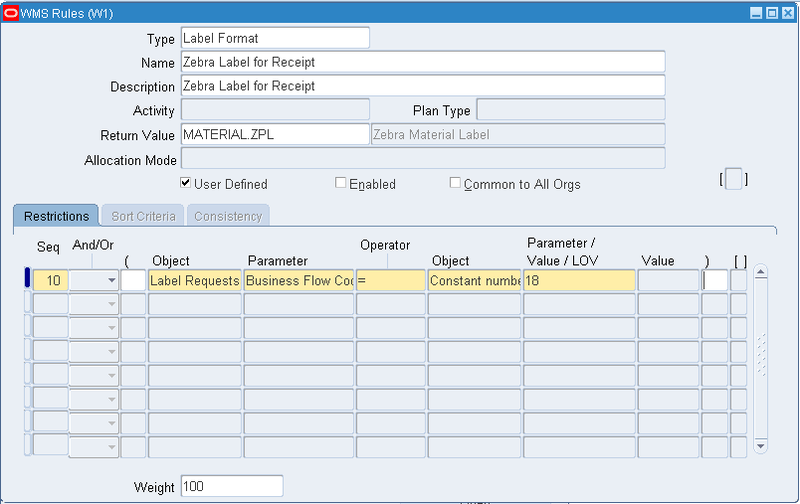 Oracle Warehouse Management recognizes a pre-determined list of Business Flows you can set up to include label printing as part of the transaction processing. 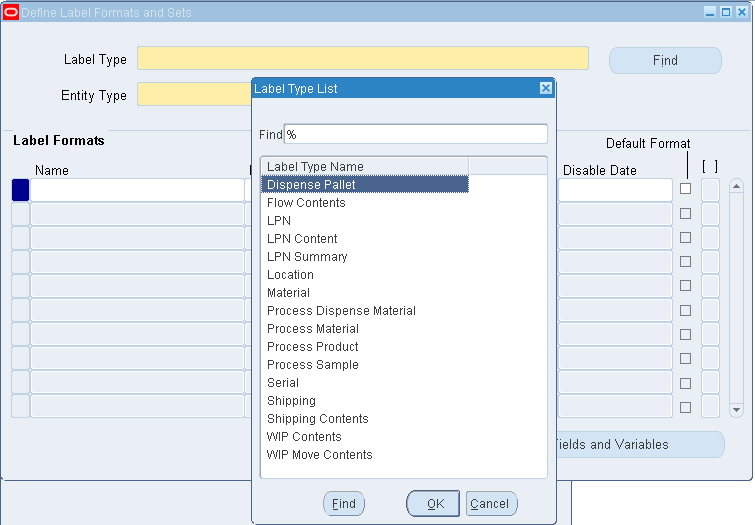 Creating label format rules is an optional step. Some implementations may require only a single label format for each label type. If this is the case, the system picks the default label format for each type. The system also picks the default if there are no applicable rules. If the implementation requires more than one label format for a label type label format rules are necessary. Printers can be assigned to Site level, responsibility level, user level.